Raglan Farmhouse is the perfect location for your next family get together, birthday, anniversary or Business Conference . BUT NO Stags or Hen Nights ! 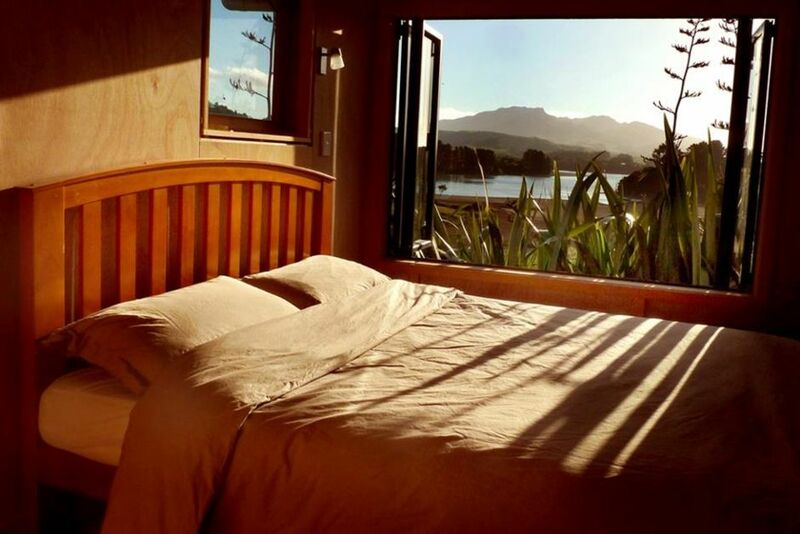 Enjoy our large out door living area that opens from the main farmhouse into our renovated Panorama Barn, this 70sqm room catches all day sun and overlooks the harbour and the sun setting behind Mt Karioi. Google us "Raglan Farmhouse" or "Raglan Farmstay" to see what other groups have said about their amazing stays here over the past years & find our website where you can book live and directly with us ! This will be our last season renting out the property, we will close at the end of April 2019 and finally get to live here full time ourselves !!! So enjoy it while you still can people !!! We have 3 Log burner fireplaces, 2 in the house and a new fire in the barn, with a pizza oven built in, plus plenty of firewood supplied to keep you toasty and Warm. There are three bedrooms in the old farmhouse, two have queen slat beds with Latex mattresses and organic duvets and bedding. Each room also has its own full sized bathroom next to the bedroom, there is also a nice little sun room coming off the lounge set up with two single devan beds. Tucked under the old Oak tree is a spacious sleep out, which features a queen bed and 3 full size single beds, and 2 Roll away single beds. perfect for a family or as over flow for the Kids ! Between the Sleep out and barn is a the big white caravan 22ft of pure luxury on wheels with a queen bed & its own living room that can also sleep a couple of kids. As you descend the stairs down to the lower garden of old fruit trees you will come across our pimped out vintage green caravan , with a lush queen mattress and a 500 gram organic duvet to keep you snugly and warm. As you pass the caravan on to your left you will discover a beautiful wooden cabin with a queen bed and north facing bi-folding window that looks out under the pear tree. There is also an open flat lawn in the lower garden out of the wind perfect for tents and power points for motor homes if you really need to squeeze in a few more friends or relatives. The house it self is situated on 2 acres at the beginning of Raglan township, less than 1km from the town center. We have plenty of space to turn and park Boats or Caravans, as well as large grassy areas for the kids or dog to run around on. Raglan Farmhouse is specially set up for groups to do little events like: birthdays, small or second weddings, family reunions and business conferences, in our 70sqm renovated & insulated barn with epic sunset views. BUT we do NOT allow Hens, Stags or Loud parties ! We live on the adjacent land up the back in some buses and caravans, and we will control excessive noise and loud music after 11pm. Great place - fit us all in nicely. Lovely outlook and friendly and flexible owner / staff. Not quite what we were expecting. Location good in terms of beautiful view over the estuary. Plenty of space but all aspects of accommodation a little run down and 'character'. Absolutely stunning, and so comfortable! Good location. Beds needed upgrading. Great for a large family having a function. Nice people to deal with and very good views. Located close to all amenities & a stones throw from the waka ama venue. Located close to all amenities & a stones throw from the waka ama venue. House is quirky & adorable, decked out with everything you need and plenty of space to fit a large crew. Enjoyed the spa and views from the deck oh and the fireplace! !